Hands down one of my favorite herbs in the world!! The smell alone uhhhhh… it is the best, it transports me to another country! The flavor is so amazing, it’s earthy and the color is so bright! Not to mention super quick to make. 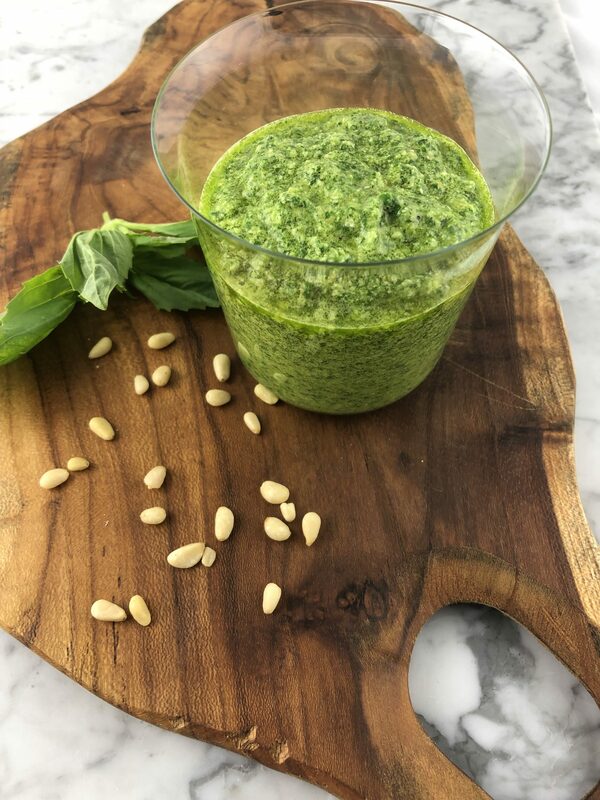 You can put this pesto on so many dishes, I add this to a lot of pasta dishes and great on appetizer’s, pizzas or even used as a simple dip with fresh bread. Follow the instructions below to insure you maintain that bright green look! *couple other pointers: Keep refrigerated for 1 week. If you have any extra that you are not using that day or week, you can place the remaining pesto in your ice tray and freeze until you need some. When you want to use, leave it out at room temperature to defrost. also NEVER heat up pesto! toss fresh pesto with cooked pasta, the heat from the pasta will warm pesto..